The most interesting and effective way of hunting in winter snow, under the wind hunting down the binoculars and carefully concealing the beast. Trekking is possible from 1-6km from base camp. A sound approach to the animal will provide our guides-the Evenki, the experience of hunting which is thousands years old. The approach depends on the weather conditions and the potential for a good shot, usually up to 100m. Winter hunting is the most interesting, dynamic and profitable because in this time is the migration of large forest deer in places they can access and quick snowmobile gives you a sure chance to get a decent copy. 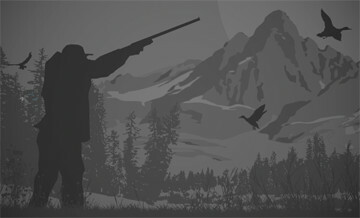 Hunting is carried out by the method of stalking the herd and surge hunters exactly exhibited at the rooms. Individual hunting with the approach on skis 1PH/1Hunter. For hunting in a forest reindeer, it is necessary to have rifles of a calibre not less than 7,62х51мм, optical sight. Camouflage color hunting season, warm, not rattling comfortable clothes designed for pace. to -5°C and fall to -30°C in winter. Сombined hunting and fishing. Hunting: Reindeer male Red deer male (Manchurian deer) Moose male Hazel grouse Capercaille Duck Fishing: Arctic grayling Lenok (Brachymystax lenok) PRICE: 9800 USD per group!!!!!!! (from 1 to 5 people)!!!!!!!!! Reindeer and Red deer (Manchurian deer) combined hunt.